Sony launched its new PlayStation device last year at E3, in a bid to compete with Nintendo's new 3DS and Microsoft's XBox Live. 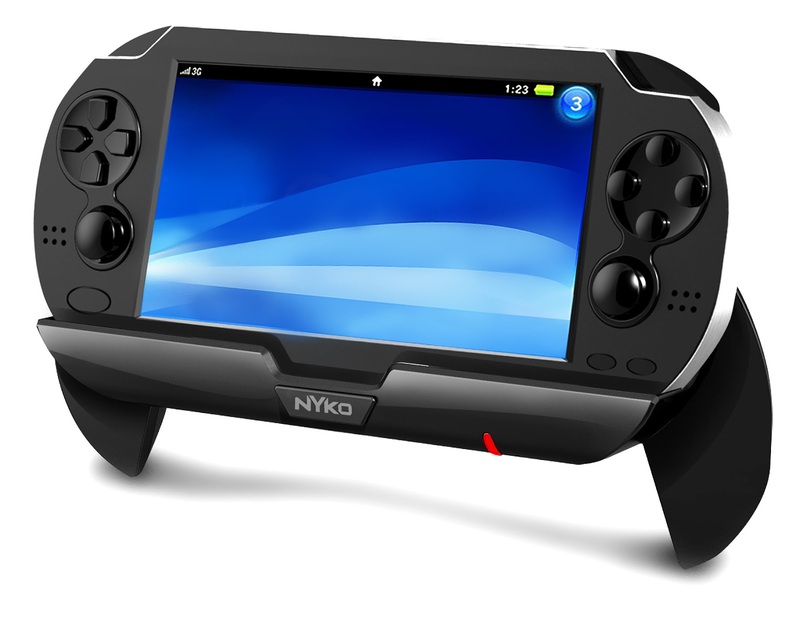 It's called PlayStation Vita and is a follow up to PSP 'Go!'. The PS Vita is the most powerful, dazzling and impressive handheld games console ever built. Its portable and stylish. Lots of new and attractive features have been added to the Vita and its different in many ways from its predecessors PSP 3004 and Go.The front dominated by the whopping 5-inch screen, with the dual analog pads to either side, the D-Pad on the left and the face buttons on the right, in a layout that will immediately seem natural to anyone familiar with a dual-shock 3 controller.It has got games that go way beyond what any other portable device is currently capable of. It sure seemed tempting to me when I first saw the E3 launch trailer. It has some super cool features which made me crave for it. When I bought it, I realized it was worth it. Though, like every other device, it has its own shortcomings too. But all in all, its a game console to drool for! It is the first Sony console to have Wide Area Augmented Reality (WAAR) feature. Here I am going to give my personal opinion on it's apps and the new added features. The PS Vita is manufactured and packed in a very safe manner. It has several accessories equipped with it. Though there still are some equipment that are sold seperately. But nonetheless, it all comes packed and wrapped in one box. Instruction Manual: In different languages, to explain how to boot and operate the device. Warranty Card: Has to be filled by the keeper of the shop you bought it from. AR Cards: These cards are used for virtual reality (Augmented Reality) game-play, to which I'll get back later.Each card pack has a redeem code which can be used on PS Store to obtain discounted or free AR games. Adapters: Chargers may vary from one box to the other. The charger wire can also be used as a USB cable port. PS Vita: It is safely packed in a thermoplastic-kind of a soft wrapper. The PS Vita weighs heavier than a slim PSP 3000. Even heavier than a fat PSP 1000. If you have bought a full set of the device with other equipment, then it also comes with a memory card as small as one's thumbnail. It is usually sold separately. I bought the pack that had the Uncharted: Golden Abbyss game in it. Screen (Touch Screen): 5 inches It is fast, responsive and multitouch aware. Rear Touch Pad: Vita has an impressive rear touch pad which can be used in games, Welcome Park and Internet browser. It has a trademark XMB patterned design of X's,circles, triangles and squares. Multi touch screen (capacitive type): Its the first ever portable Sony console that has an interactive touch feature. Front camera, Rear camera: Even the camera feature is a first. It can be used to click pictures, record videos and play AR games. The home screen is amazing! it’s a beauty; crisp, clear, with vibrant colors, deep blacks and brightness to spare. Augmented reality that makes the best use of PlayStation Vita’s dual cameras and the most awaited feature. With a 0.3 megapixel Sony's initial efforts at making AR gaming work are great, bite-sized chunks of silly fun. Reality Fighters, for example, allows you to digitize your face, map it onto a CGI body, (the body doesn't go with your face though, well at least mine didn't. It looked really weird) and then whack ten tons of stuffing out of Vita-owning friends or CPU-controlled opponents in the real-world environment of your choice. The fighters sit quite convincingly within the landscape in front of the lens(you need augmented reality (AR CARDS) it’s certainly a good one. The final killer app in PlayStation Vita’s armory should be Remote Play - a development of the feature in the old PSP. It’s a great idea, enabling you to play selected media and games on a PlayStation 3 and stream them to Sony's little box of tricks, so that you can enjoy them with the living room TV switched to another channel or turned off. Unfortunately, when we say ‘selected’ we mean it. In testing we couldn't get Blu-ray discs or PSN video files to stream, and the only PSN video service we could get to work was Vidzone. Beyond games PlayStation Vita has a range of apps pre-installed, mostly focused around media playback or communications, with more to be available at launch. Welcome Park is a nice starting point, giving you a selection of tutorials and augmented reality activities that get you used to the main features of the device. Meanwhile, the Friends, Group Messaging and Party apps give you means of checking up, organizing games with and chatting with PSN friends. Finally, the Web Browser, while lacking flash functionality and not feeling particularly brisk, is a big improvement on the PSP’s or PS3’s efforts for the simple reason that it has a touchscreen keyboard for text entry and touchscreen controls.My favorite apps are Paint Park, YouTube and Live Tweets (Facebook app is not very accurate). living nearby, i don't really use it. Issues with OS (occurs rarely) but it’s the kind of thing that might also change with future firmware updates and future game releases. This is a guest post by Kunjika Singh. You can find her on Facebook here. If you want to write a article for our blog, you can contact me here.